Jerry Dias says "everybody's furious" with GM's decision to close Oshawa Assembly. 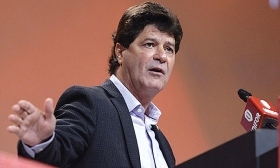 Unifor President Jerry Dias said that if it were up to him, workers would strike every General Motors assembly plant in Canada and the United States in response to the automaker’s plans to close its Oshawa, Ont., factory. Dias, speaking with Automotive News Canada on Monday, called GM’s decision to not allocate product to Oshawa beyond 2019 “the ultimate betrayal” and promised the union would fight the move. GM on Monday said Oshawa was slated for closure and that two assembly plants in Michigan and Ohio would not have any allocated products beginning in 2019, among other cuts and changes to its global operations. The Oshawa plant builds the Cadillac XTS and Chevrolet Impala and does final assembly on pickup bodies shipped from the United States. Dias said he has been in touch with his counterparts at the UAW in the United States and said there would be “one hell of a fight” with GM in Canada. Dias did not promise that a continent-wide strike would happen, though workers at the Oshawa plant did walk out on Monday morning in protest ahead of GM’s announcement. A UAW spokesman was not immediately available for comment. “We must step away from the anti-worker thinking of seeking simply the lowest labour cost on the planet,” UAW President Gary Jones said in a statement. Dias appeared to be caught off guard by GM’s plans, saying he received a call from GM on Sunday informing them of the allocation decision after he had already received calls from reporters inquiring about the news. A 2015 study commissioned by Unifor estimated that shutting the plant would eliminate 4,100 direct jobs and reduce Ontario's gross domestic product by C$1.1 billion ($830 million). Unifor’s auto director, Dino Chiodo, says “it makes no sense” for General Motors to close its Oshawa Assembly Plant, northeast of Toronto. The union will have the opportunity to sit down with GM executives Monday and possibly Tuesday, too, Chiodo said. Chiodo believes the plant deserves to stay open because of its production performance over the years.